But Beatrice Mukabarenzi’s life has taken a dramatic turn since she enrolled in Gikuriro, a 5-year project of Catholic Relief Services and the Netherlands Development Organization with funding from the U.S. Agency for International Development. 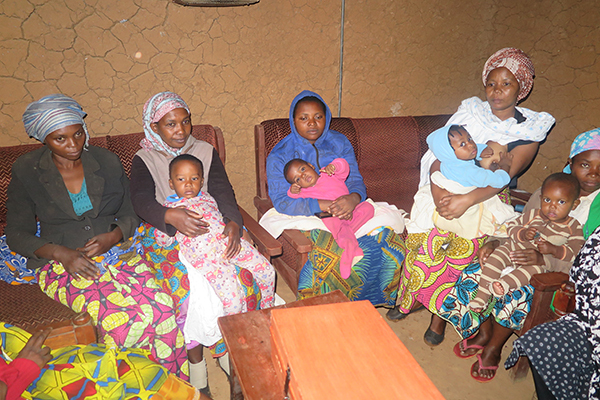 The mother of 5 was married by age 19 and has a primary-school education. Her husband used to be the sole breadwinner, and struggled to put food on the table. The family often skipped lunch or dinner, and even breakfast seemed an improbable dream. Caring for the children often meant watching them suffer from hunger, and Beatrice saw no way to change their situation. 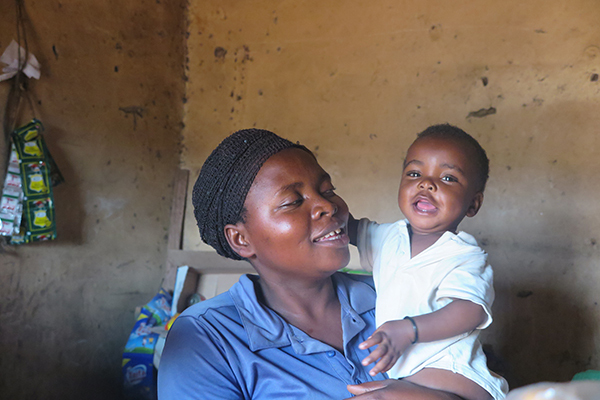 She was introduced to the Gikuriro program through community health workers when they discovered that her 15-month-old was malnourished. Lack of financial services is a chronic problem for many people in rural Rwanda. They live far from banks and other financial institutions, have no collateral for loans, and may face cultural barriers to saving and using credit. CRS’ savings group model encourages participants to pool their money so they can help each other meet basic needs and invest in income-generating activities. Most members take loans to pay for their family’s health insurance or to start small businesses. Beatrice’s first loan was for about $12. With the money, she started a small business selling vegetables and fruits from a basket on the street. Three months later, after she had paid back the money, she received a bigger loan of about $24 and was able to move her business from the street to a shop entrance. And a third loan of about $37 allowed her to rent the house where she now runs her business. Today Beatrice not only sells her own goods, she buys goods from others to sell in her shop. The growth and stability she exhibited through her business investment earned community members’ trust. “They sometimes give me some items to sell, and I pay back after I have sold them out,” Beatrice says. As her income grew, the first thing she did was improve her children’s diet. “I didn’t want them to eat a poor meal or skip a meal anymore,” she says. And Beatrice is happy her shop is near their home so she can earn a living and still care for her children. She is determined to continue saving and take her business even further. Many women like Beatrice are improving their families’ lives, thanks to the Gikuriro savings groups. Nutrition has improved for children under 5—and for their families—and water, sanitation and hygiene are better. Gikuriro engaged in a monthlong door-to-door campaign in November to talk about the benefits of saving with communities in Rwanda. More than 1,000 savings groups are operating in the 5 Rwandan districts where Gikuriro is active. Together, members have saved more than $100,000 and more than $80,000 in loans have helped group members with business startup and investment.